⇒You need rice to play the adventure battle mode stages. In other game modes, you will need tickets to participate. For example; to play duel, you need duel tickets. Rice regenerates over time. And, you get tickets(daily dungeon ticket, raid ticket) on daily basis. Both these items can be purchased from the shop. ⇒You can assign up to five heroes(except clan raid and survival mode) in the team and choose one of the available formations. Before you start the battle, you can change the formation. You can enhance the formation to activate powerful buffs. Tap the formation button -> go to the formations tab -> here you can unlock/upgrade the formations. On the same formation screen, you can change the leader. Almost all heroes have leader skills. The leader’s skill benefits all the allies in the team. Tap the change leader button at the bottom-left of the screen -> choose a leader. If you don’t know about the skill, visit the manage menu -> choose a hero -> skill -> here you can see the hero’s leader skill. ⇒Once you have selected the heroes, formation, and leader, hit the battle button to start the combat. ⇒The combat system is quite easy to understand. At the top of the combat screen, you can see the number of enemy waves. To win the battle, you will have to finish all the waves. At the bottom of the screen, you have skill options; active skill, rage skill. You can use the hero’s rage skill when the rage bar is full. The green bar shows the hero’s HP. The purple bar shows the rage. ⇒Apart from the rage and active skills, there is one more skill that you can use in the adventure; ultimate skill. At the bottom-right corner, tap the ultimate skill button to unleash powerful energy. By default, you have Blizzard skill. You can unlock more skills such as Energy of Regeneration, Shadow Assassin, Thunderstorm, Phoenix Fire, Call of Death after reaching a certain level. Read the Final Blade ultimate skill guide below for details. ⇒A spirit will appear on the screen when the heroes kill an enemy. Make sure to collect these spirits. You may get pearls or sapphires. ⇒From the adventure mode stages, you can obtain player EXP(to increase account level), hero EXP(hero level up), gears, gold, and heroes(1*-3*). These low-quality heroes can be used as fodder(in enhancing high-grade heroes). ⇒If the bag is full of items, it would not let you enter the combat. You can increase the bag slots with sapphires. Go to the bag menu -> tap the + button next to the number of slots -> confirm. It costs you Sapphires. If you don’t have enough Sapphires, it would be better to sell the useless gears. Selling gears drop Sapphires. ⇒You can use the sweep tickets to get instant rewards from the cleared stages(3*). Additionally, you can repeat a stage for player EXP, hero EXP, gears, and gold. So this would be all for now as Final Blade guide to battle preparation and combat. Let’s have a look at the heroes guide. ⇒Heroes in Final Blade are classified into grades; 1* to 6* -> advent. For the long term, it would be better to focus on high-grade heroes rather than spending precious time and resources on building useless heroes. We would recommend you to focus on 5-6* grade heroes. But, not all the grade 5-6* heroes are good. When choosing a hero for the team, pay attention to the ratings posted by other players. Go to the index menu -> tap on a hero -> at the bottom-left, tap the forum option -> here you can see other players’ review. ⇒Low-grade heroes and the duplicate heroes can be used in the developing high-grade heroes. For example; In enhancement, advent, superior enhancement. Additionally, you can combine two same grade heroes to get an upper-rank hero. Read the combine/merge guide below. You can obtain heroes from the shop. Use sapphires or gold. Low-grade heroes can be obtained from the adventure mode stages. Go to the index menu and tap on a hero to see all the details; stats, class, attributes, skills, and more. The index menu shows you the complete list of heroes featured in Final Blade. ⇒You can power-up heroes by increasing their level, enhancement level, equipping gears, increasing the skill level. Let’s learn about all! Increasing the hero level improves its stats; attack, HP, defense, and more. You can level up a hero through mentor training, clan training or playing the adventure mode stages. From the adventure mode stages, heroes in the team gain Hero EXP, which is required for leveling up. Depending on the grade, a hero’s maximum enhancement level is determined. Go to the manage menu -> tap on the hero that you want to enhance -> hit the enhance button -> select the heroes that you want to sacrifice to develop target character. It will cost you gold. On the same screen, you can check the success rate over their portraits; 25%, 50%, 100%. If the success rate is low, a hero may fail in developing the target hero. The superior enhance function is available for grade 6 or + grade 6 heroes. It becomes available when a grade 6 or higher-grade hero reaches the maximum enhancement level. To super enhance grade 6 hero, you will need one more grade 6 hero who will be used as a material. To super enhance advented hero, you need grade 6 heroes and essence(the essence of enhance). You can get it from the market. In Final Blade, stats or power of a hero can be increased by equipping and upgrading gears. Each hero can carry up to 8 gears; cloth, weapon, boots, secondary weapon, bracelets, necklace, rings, and earrings. You can enhance these gears using upgrade material. Participate in the daily dungeon mode to obtain upgrade material. Higher-grade gears can further be improved through the awakening process. Go to the manage menu -> select a character -> go to the second tab(skills) -> tap the skill -> level up. Read the hero skills in their skill tab, compare with the rivals’ skills, ratings and continue with the best one. In your team, make sure to include a healer(with good healing skills). For example; Francie. Combine feature is one of the best functions in the Final Blade. Using it, you can easily get a grade 6 hero. All you need to do is use Sapphires and summon heroes. The drop rate for grade 5 heroes is decent. So you can easily get grade 5 heroes. You will be able to combine the same grade heroes once they reach maximum enhancement level. 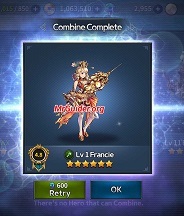 We would recommend you to use grade 2-4 heroes as fodder/material. You can easily get them from the adventure mode. Repeat the stages, sweep, grind! Once you have two heroes with the same grade at their maximum enhancement level, go to the manage menu -> select the hero -> combine -> select the heroes -> confirm. You will get a high-rank hero. For example; combine/merge two grade 5 heroes and get one grade 6 hero. You can advent a grade 6 hero. To do it, you must have grade 6 superior hero(the main one) + grade 6 superior hero(material) + eternal fox essence. Eternal Fox essence can be found in raid boss, destiny, market(Exchange) and the shop. Training is one of the best ways to level up heroes fast. On the main screen, tap the training option -> select the mentor(right side) -> start training. To grant more EXP, you can enhance the training level. At the top, tap the enhance training button -> use gold -> confirm. You can not go beyond the account level. You can get training from the clan members and other clan members can get training from you. Go to the clan menu -> go to the second tab(members) -> train -> select the hero -> start training. Raise the clan level to get more training sessions. (Check-in daily, get training every day). Exploration or expedition feature in Final Blade lets you dispatch the heroes on an expedition. They will explore the region for a certain amount of time and come back with precious rewards. You can unlock more regions by raising the player(main) level. You can earn sapphires by collecting spirits in the battle, by selling gears, completing the quests; missions, weekly, achievements, events. You can obtain gears from the adventure mode stages(usually, you get low-grade gears). High-grade gears can be obtained from the clan shop, marketplace and other game modes. All the heroes have unique skills; active, passive, rage, and leader. Active – Tap the skill icon at the bottom of the combat screen to use. You can not use it if it’s in cooldown stage. Passive – Passive skills are activated whenever the condition is fulfilled. Leader skill – Assign the hero as a leader to use his/her leader skill. Rage Skill – Just below the HP bar, you can see the rage gauge. You can use it once the rage gauge is full. Rage Gauge fills as you attack, receive damage, use skills, kill enemies, and over time. To use the ultimate skill in the battle, you need Ult fragments(Ult Scrolls). Ult fragments can be found in the daily dungeon mode. Tap the ultimate skill button on the battle preparation screen -> here you can unlock new ultimate skills and enhance them. Tap the equippable button to equip ultimate skill. All the ultimate skills are different; supportive, offense, and more. Use the ultimate skill to gain EXP and enhance/level up ultimate skill. In Final Blade, Fairy automatically collects the spirits from the battlefield. After the battle, it will convert these spirits into pearls or sapphires. It’s a premium feature(you get for free in the tutorial). Without Fairy, you will need to collect the spirits manually. So this would be all for now as Final Blade guide. The in-game guide is also useful. To access it, tap the menu button at the bottom-left -> help. Let’s have a look at the quick Final Blade tips! If you have more tips and heroes recommendations for other fellow players, do let us know in the comment section below!